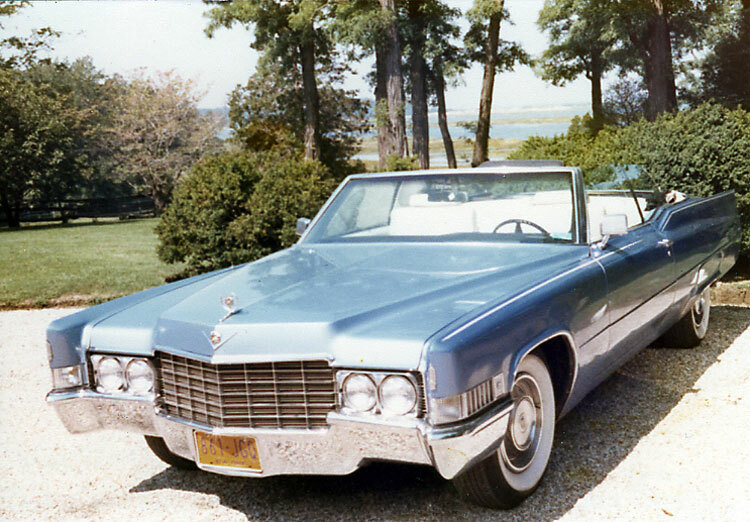 1969 Cadillac DeVille with background of Long Island Sound, Stony Brook, L.I., N.Y.
Notice the original hub caps before they were replaced with spokes! Click on the picture for an enlargement of the blue 1969 "Stonewall Car"! The S.V.A. never sells, rents or trades its private email address list! Pictured: Sonia Jane Attkiss and Willson L. Henderson with 1969 "Stonewall Car"
Wonder who owned the car? Look at the N.Y.S. license plate: WLH-33! Prestige Auto Repair on Third Avenue in the Upper, Upper East Side of Manhattan, N.Y.C. 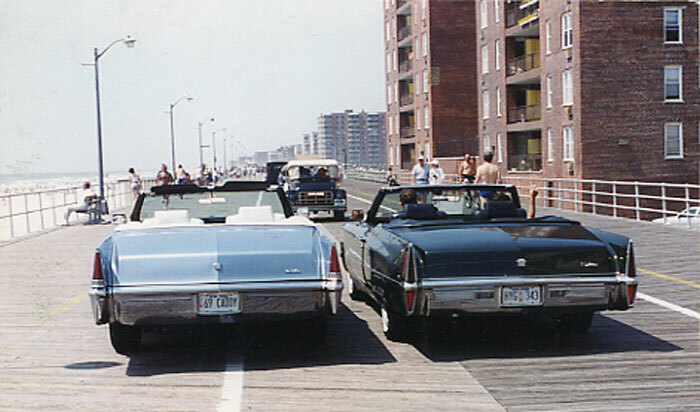 Classic car parade on the Long Beach Boardwalk in Long Island, N.Y. 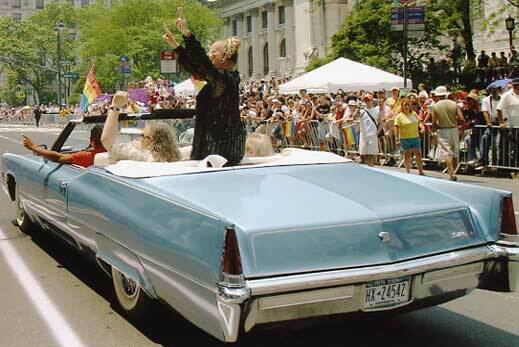 Note: New York State license plate reads "WLH-69"
The now famous 1969 "Stonewall Car" was so named not by the STONEWALL Veterans' Association ("S.V.A. "), which now owns the car, but by many people in the streets subsequent to the 1969 Stonewall Rebellion. 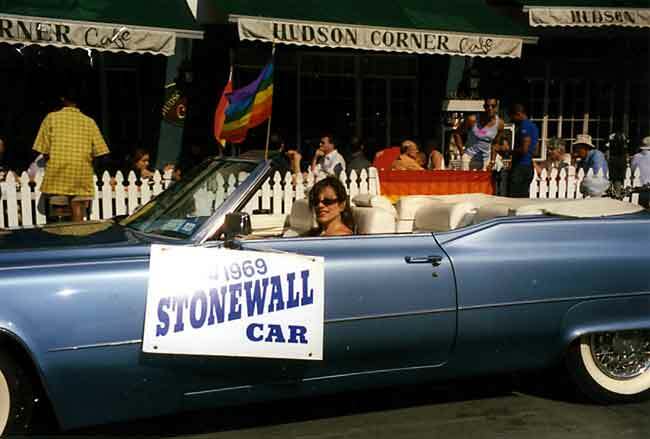 We regularly drove the eye-catching, metallic blue, show-boating, big car down the full length of Christopher Street from Greenwich Avenue to West Street (West Side Highway) at the Hudson River in Greenwich Village, New York -- and still do -- and many Gay and other people yelled out -- and still do -- "The 'Stonewall Car'"! The true blue "Stonewall Car" at night and, from a downward angle, looking coupey! Those original participants and observers readily recognized the cool, unique, stand-out, metallic blue, big Cadillac convertible, one-and-only car impounded ("hijacked") by the New York City Police Department ("NYCPD") on the first night of the Stonewall Rebellion (it was not a 'riot' -- no vandalism, no injuries, not one auto insurance claim) on Friday night, June 27th, 1969 at about 2 a.m. The car with the top 'down' had been parked, as usual, on the same long block of the Stonewall Club on Christopher Street -- really only a stone's throw from the club's entrance. The car was driven (not towed, as many mistakingly think) by two un-uniformed NYCPD police officers to the old Sixth Precinct on Charles Street near the Hudson River in Greenwich Village. Fortunately, the event was a 'rebellion' and not a 'riot' or the car would have been definitely damaged or possibly destroyed. If it had been a 'riot', there would have also been a huge amount of other automobile insurance claims. In reality, there were no insurance claims by anyone for anything -- not even a scratch. The police illegally held the car -- their 'trophy' -- for three nights and two days at their precinct! Thus, it was never officially impounded. Instead, it was marked in chalk on the windshield: "RTO": Return To Owner! A quarter-of-a-century later on January 1, 1994, the 1969 "Stonewall Car" officially was bestowed with "vintage" automobile status in accordance with the New York State Department of Motor Vehicles' requirements and guidelines. A vehicle must be at least 25 years since production for 'historic' designation. It is ironic that this silver milestone for the historic car occurred in the exact year of "Stonewall 25"! Remember, the car and the rebellion were born within the same year! 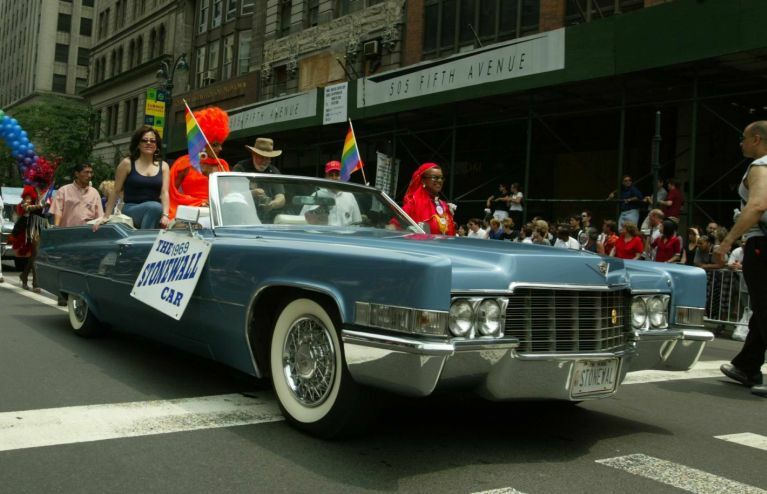 Throughout the Spring of 1994, the "Stonewall Car", with actual veterans of the 1969 Stonewall Rebellion, was on prominent display at seemingly endless events, celebrations, commemorations and even Gay clubs and restaurants hosting "S/W-25" parties and dinners and churches memorializing this historic anniversary. 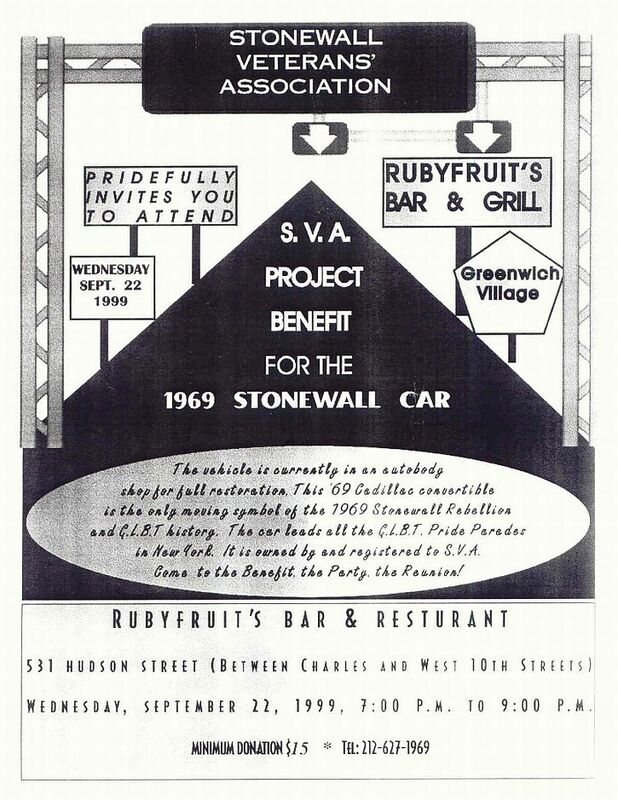 On "Stonewall Sunday", June 26, 1994, the famous 1969 "Stonewall Car" was in the New York Sunday News (with a circulation of nearly one million), describing the history of the car vis-a-vis the Stonewall Uprising. The only Gay newspaper in New York City at that time was the New York Native, which assigned a reporter to the car, the Stonewall veterans, the 'alternate' march and the S.V.A. at the huge rally for the entire day. 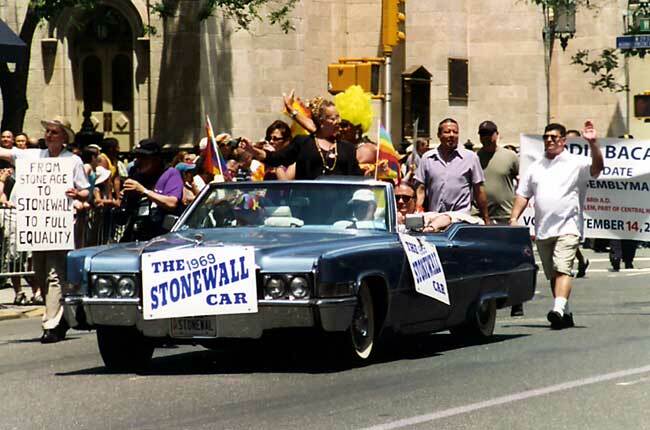 The New York Times described the "Stonewall Car" as "... in mint condition". That is the supreme automotive compliment! 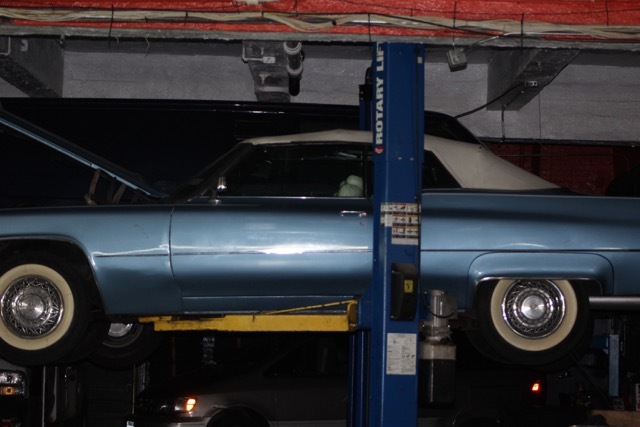 Captivating Video of the 1969 Cadillac Convertible -- Photos Outisde and Inside! 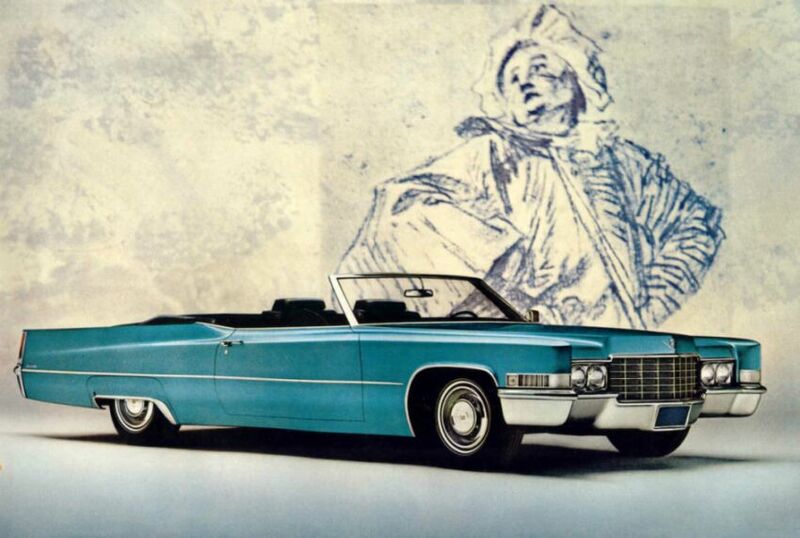 The 1969 Cadillac DeVille convertible is shown on this brief video from all sides and the interior! This is not --repeat 'not' -- the "Stonewall Car"! Howver, ironically it is the same exterior color of metallic blue and the exactwhite leather interior. It fully shows the dashboard and even the rear seat two chrome ashtrays. You will notice that the Cadillac convertible in the video does not have the big wide whitewalls. It does interestingly havethe custom wheel extension off of the rear bumper. That would make the already long car about twenty-one feet long! S.V.A. event flyer for an external 'restoration' benefit for 1969 "Stonewall Car"
The beautiful, blue acrylic lacquer 1969 convertible "Stonewall Car" led the historic 1994 "Spirit of Stonewall March" from the landmark Stonewall Club area in Greenwich Village, New York, through some narrow Village streets passing the historic Washington Square Arch, with the huge Twin Towers of the World Trade Center in the distant background, all the way up Fifth Avenue with cheering spectators, to Central Park! At the Avenue of the Americas and West 59th Street entrance to the park is where the two huge marches came face to face. There was a loud street 'debate' from the heads of both groups as to which march should enter first. That, to a historically-correct, respectful, prideful person was a no-brainer. Basically, the Stonewall veterans were just sitting a spell in the sunny light with people gratefully taking pix of the car saying to each other that "...ain't no one gonna be goin' into that park on this glorious day before this beautiful 1969 convertible "Stonewall Car". 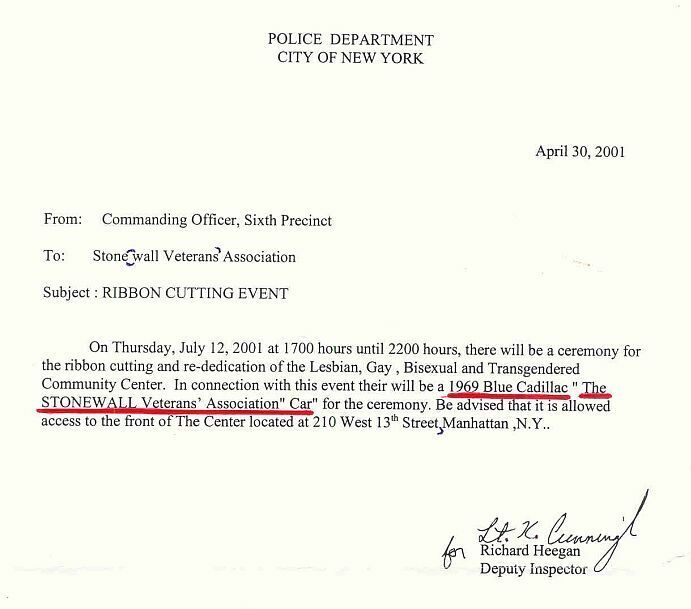 It was ultimately 'decided' via edict by Queen Allyson Allante that the march with the historic 1969 "Stonewall Car", the STONEWALL Veterans' Association and the Imperial QUEENS of New York, et al. would go first. The decision was actually enforced by the S.V.A. troops and put into action when the queen issued her royal warning: Watch out! -- or you'll get run over by the two-and-a-half ton "Stonewall Car"! So, this popular car now lead hundreds of thousands of G.L.B.T. people and their friends and supporters and the press into the park, where hundreds of thousands had already congregated in anticipation of the biggest G.L.B.T. rally in history! Have you ever brought your car to be part of an event with a real million people? 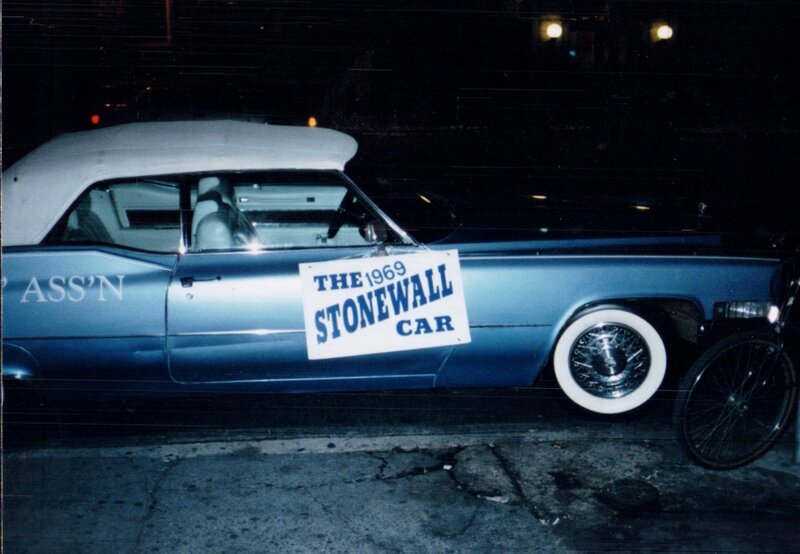 The "Stonewall Car" was the only car in the entire Central Park that glorious day -- along with (as estimated by the NYCPD) about 1.1 million people! 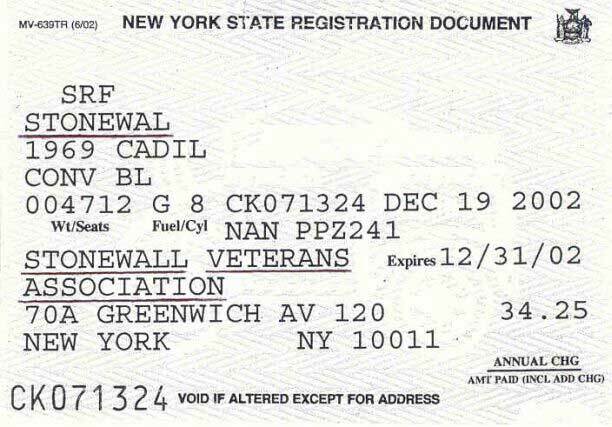 New York State Registration Card for the 1969 "Stonewall Car"
The vehicle identification number (VIN) has, of course, been deleted. The 1969 Cadillac DeVille convertible "Stonewall Car" is proudly owned, diligently maintained, safely garaged, fully insured and carefully cleaned by the STONEWALL Rebellion Veterans Association ("S.V.A."). 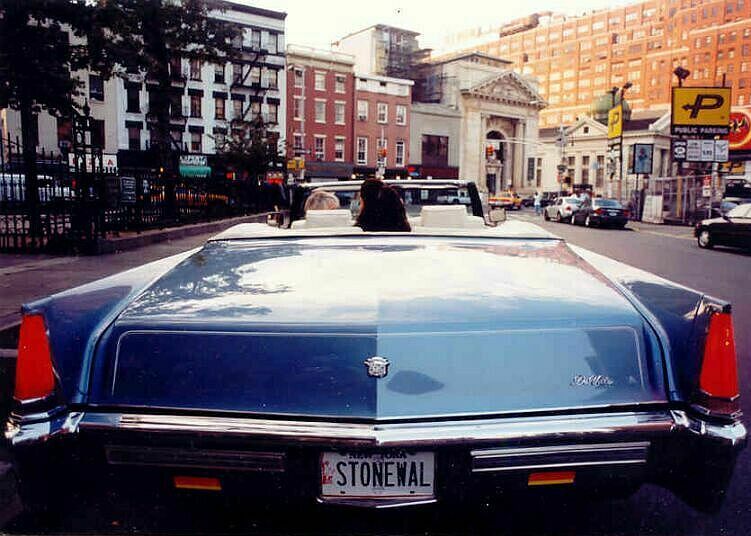 Years after the Stonewall Rebellion, the appropriate license plate for the "Stonewall Car" was secured: "STONEWAL". In New York State you can only have eight characters (letters and/or numbers) on a license plate. The saved last "L" is for "Liberators". The cost of garaging this historic, valuable, classic car is about $400 per month in a solid, heated, secure and convenient Manhattan, New York, garage, that is, totaling nearly $5,000 per year. And, that is just for the garaging of the car! There is also auto insurance, maintenance, license plates, registration and sometimes a repair or two. The "Stonewall Car"is one of the many worthwhile reasons why the S.V.A. must upkeep its fund-raising throughout the year. Otherwise, there would be no irreplaceable "Stonewall Car" for the future -- starting tomorrow! New York Daily News does a popular story on the 1969 convertible "Stonewall Car". U.S. 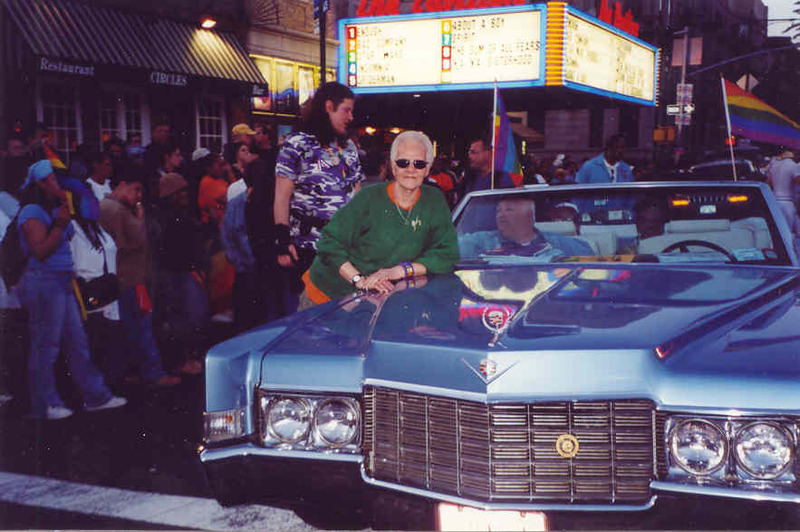 Senator Daniel Moynihan declared the S/W-Car "A rolling symbol of Gay Pride!" Note: In the purple shirt is Vito Abzuzzoluccione. For you car buffs, and other interested parties, here are some very interesting factoids regarding the 1969 Cadillac DeVille convertible. General Motors Corporation (GMC) described this Cadillac as its "crown jewel". Right they were! Its weight is over 4,600 pounds (nearly 2 1/2 tons! ); its length is 225 inches (nearly 19 feet long! ); its width is 80 inches (over 6 1/2 feet wide); its height is 55 inches (with convertible top up); its wheelbase (the distance between axles) is 130 inches; and its massive, powerful, fuel-efficient, 375 horsepower, V-8 engine is 472 cubic inches at 4,400 r.p.m. (revolutions per minute). It is the largest V-8 engine ever produced to power a passenger car! The Cadillac has the great standard-equipped power steering, power brakes, six-way power bench seat, power windows, A.M./F.M. stereo radio, power radio antenna and, most importantly, power convertible top. The convertible top is made of white, triple-woven padded canvas with a real glass rear window. One option the car has which we rarely use is the "automatic climate control system". When is the top up? Never! No, not even in winter. The car is kept with the top down year-round and a custom canvas cover over it. The seating areas are white sierra ostrich-grain leather. The flooring is midnight black pile carpeting. The dashboard, door panels and rear seating area side panels have inlaid, designer grain wood. The entire car interior is original! The custom Vogue tires are extra-wide whitewalls. The wheel covers are solid chrome spokes. The fuel tank capacity is a whopping 26 gallons (plus one gallon reserve). The locked gas cap is hidden behind the rear license plate ("STONEWAL"). 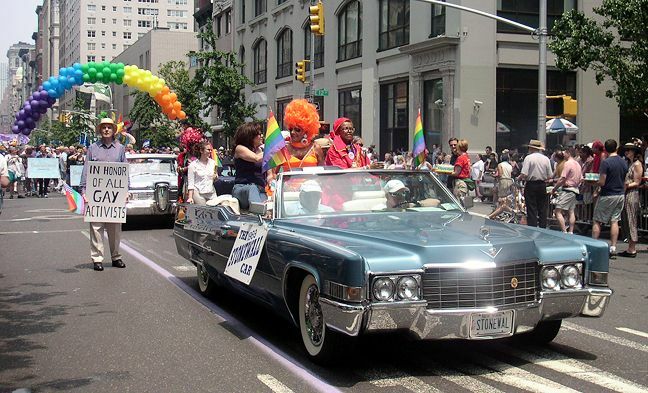 The "Stonewall Car" has traditionally led the NYC Gay Pride parades! Over 16,000 of these classic Cadillac convertible cars -- a very large number for a luxury convertible -- were produced by General Motors Corporation with "Body by Fisher". The huge chrome bumpers and massive front with cast aluminum "egg-crate" grille was used as a design model for Cadillac grilles for the following two-plus decades into the 1990s. The car front debuted the innovative and safety-conscious wrap around cornering lights (now found, though less grandly, on almost every car). 1969 was the year that front seat headrests (restraints) became mandatory by law. Seatbelts were now required to have a push-button open/close mechanism. 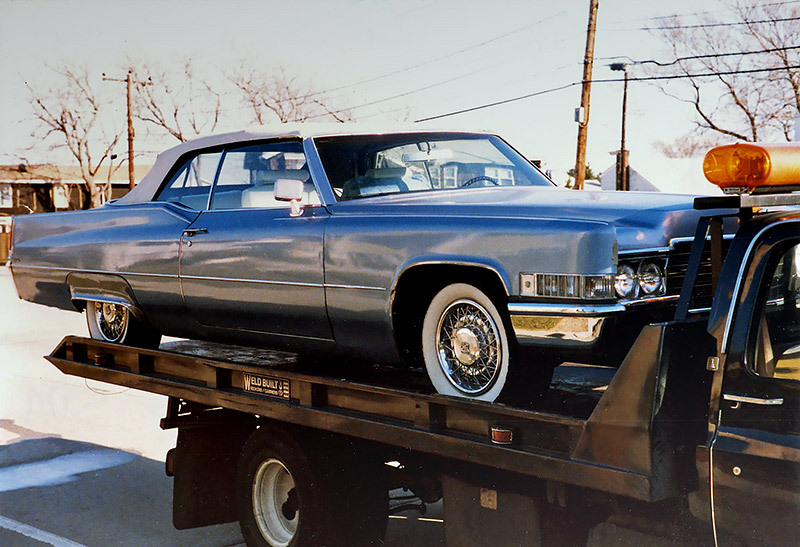 The 1969 Cadillac marked the public-wanted return of the dual horizontal headlights (after four years of the vertical, un-Cadillac, 'stacked' headlamps). (See "SW-30" on the S.V.A. website "Photo Album" icon for pix of a 1966 blue Cadillac convertible, periodically with the S.V.A. in the parades.) In 1959, back-tracking a decade, Cadillac had the incredibly unique, "bullet" tail-lights. Ten years later, it seems that they made a point to have the 1969 tail lamps be unique. 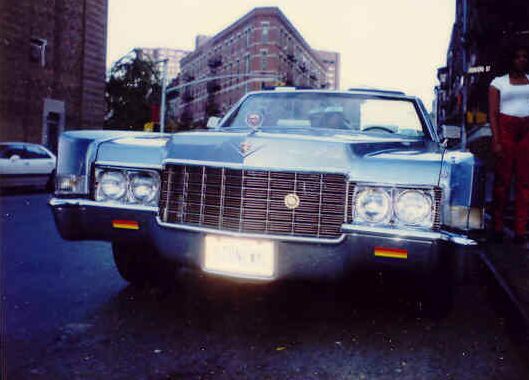 1969 was the only year that the Cadillac had the distinctive "lantern" tail-lights. They complemented and were built-in to the slowly sweeping, modified tail fin. For an excellent foto of the tail lamps, see the Greenwich Village, New York photo on Greenwich Avenue at Jackson Triangle Park below. 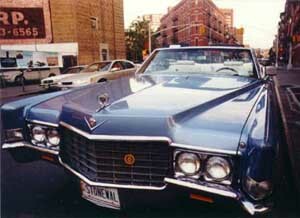 In fact, virtually the only difference between the 1969 and the 1970 Cadillacs (same body, same size, same stats, etc.) were the tail-lights. The 1970's returned to the Cadillac it's well-known, long, vertical tail-lights. 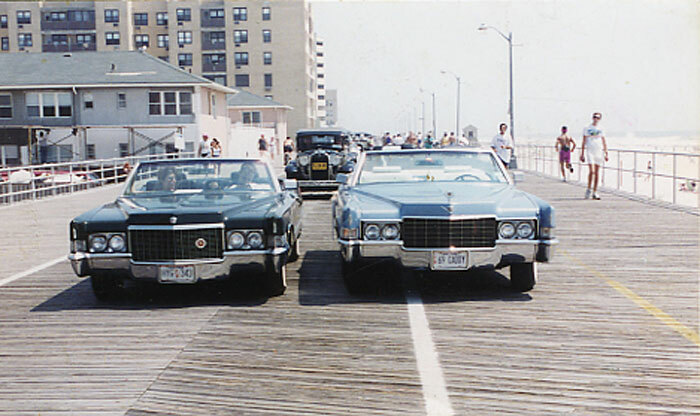 The 1969 and 1970 Cadillacs (98% identical twins) were widely described as "muscle cars with tuxedos". It is most appropriate that the 1969 is both distinctive and 'different'. 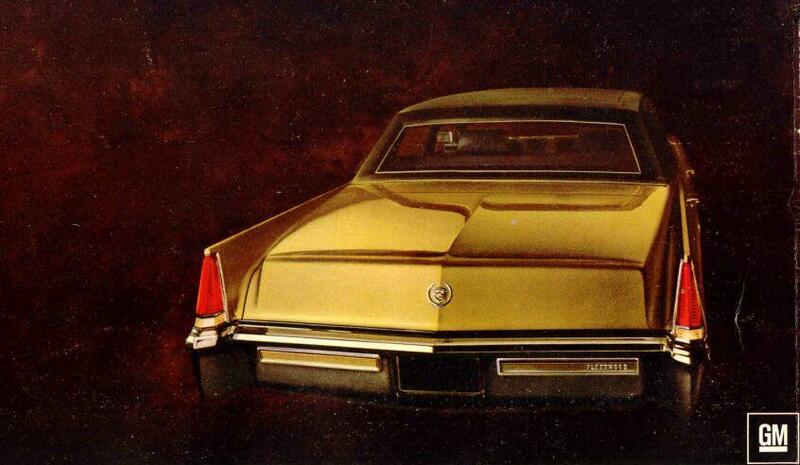 The ad slogan for the 1969 Cadillac was: "The pleasure of driving the only luxury convertible built in America!" Over three decades later, that horn slogan still blows true -- and with even greater significance! 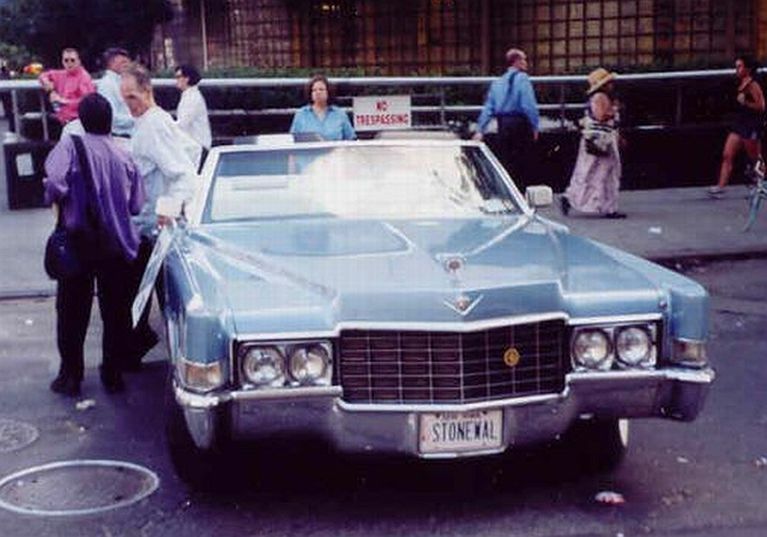 A "Stonewall Car" prior New York license plate: "STONEWAL"
The most frequently asked question about the "Stonewall Car" ("S/W-Car") is: "What is the mileage?" At the turn of the millennium (2000), theSW-Car had an original mileage of 94,169 on New Year's Day. It continued to stay in the heated garage until June! The mileage was only 94,894 original miles three years later as of January 1, 2003, actually regarded as a very low figure considering the vehicular age. At 35 years, as of April 1, 2004, the mileage was only 94,954. OnJune 11, 2005,the odometer read alow 95,169. Again, three years later, at the end of June in 2008, the mileage is merely 95,233. Since the car did not do a few parades for various reasons -- including predicted thunderstorms,lightning and rain downpours -- in the past four years (as of mid-May 2013), the S/W-Car drove less than 40 miles! In mid-2013 after the annual New York City G.L.B.T. Pride Parade, the original mileage was only 95,386. In the last dozen years less than 1,000 miles have been added to this restricted-mileage "historical" vehicle. An interesting question asked is: Was the "Stonewall Car" held by the police as 'evidence'? No! Evidence of what? -- other than the fact that Willson Henderson, the car's owner, was there. After all, there was no crime and, thus, no 'evidence'. Another often-asked query is how long did the NYCPD have (illegal) possession of the car? It was for two nights (June 27 and 28, 1969) and the day in between. It was a "P.O.W."! Thankfully, it was rescued and there was absolutely no damage to the beauty. And, considering that the NYCPD are known as"the boys in blue" and the car is police blue, we're lucky we ever got it back from them! Is the engine the original? Yes, it sure is -- and absolutely nothing overhauled. It even has the original glass window cleaner bottle and mount adjacent to the engine! Needless to say, the engine is huge! To many people who have written to the S.V.A., the above photo of the very classic convertible car evokes a well-knownhistoriccar scene from the early 1960s -- long before this 1969 car was even built! If you have any ideas on this deja vu scenario, please e-mail the S.V.A. 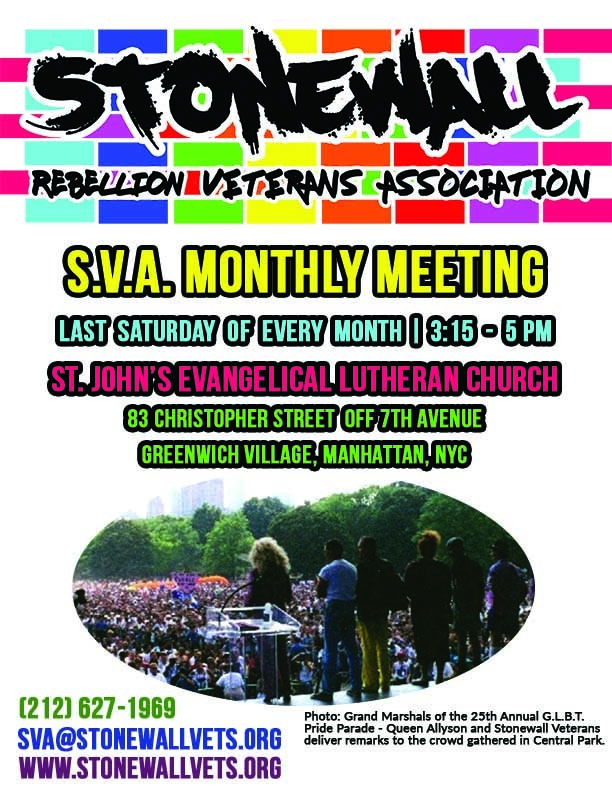 with your comments to: SVA@STONEWALLvets.org. with Derek Jeter, Paul O'Neill, David Justice, Mariano Rivera, et al. 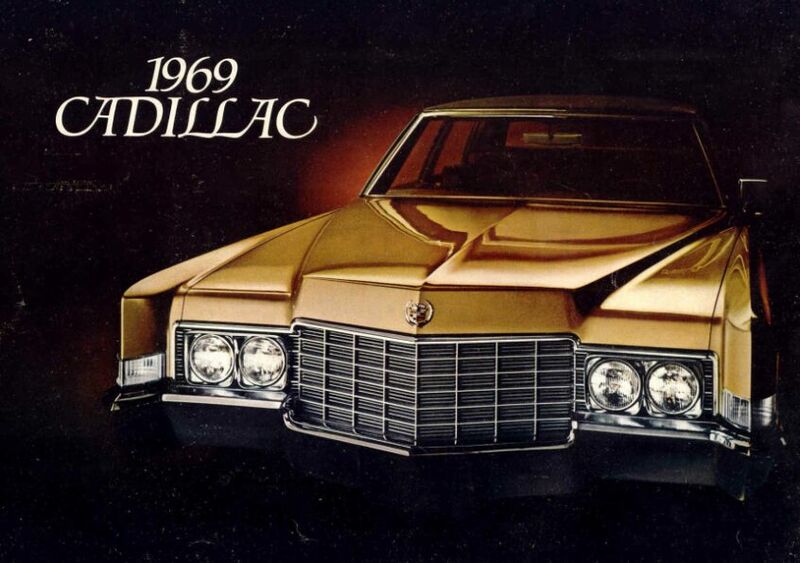 Note: The building designation states "One Police Plaza"
"100 Years of Cadillac History"
Read a 2009 interesting article on the 1969 Cadillac "Stonewall Car"
featuring an eye-catching collage of pictures by car columnist Murilee Martin. 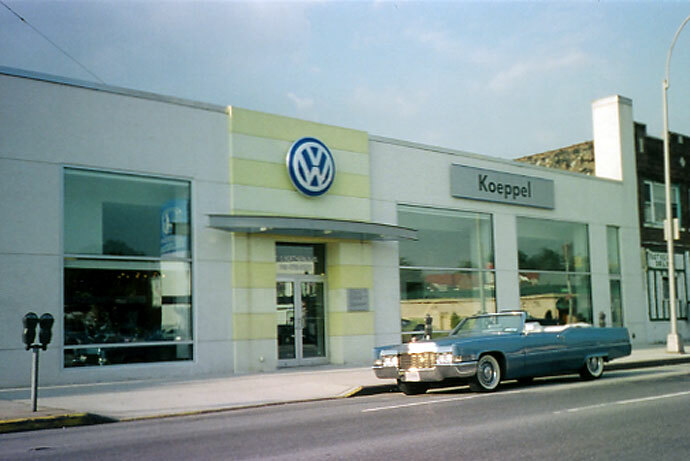 Classic Cadillac Convertible clearly commands the community! 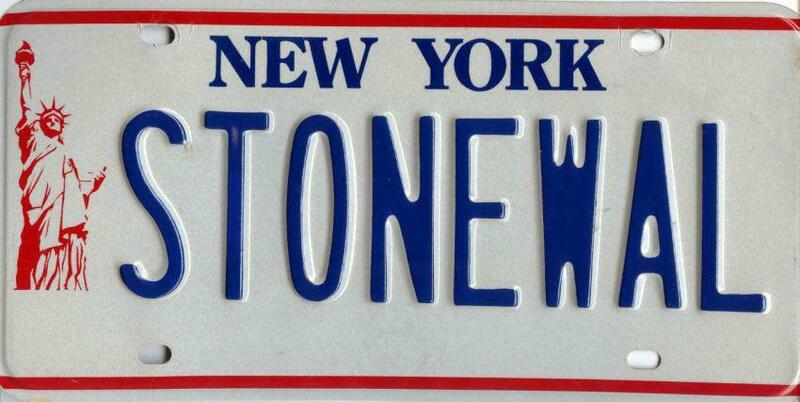 New York State "Statue of Liberty" Custom License Plate: "STONEWAL"
(letters and/or numbers). 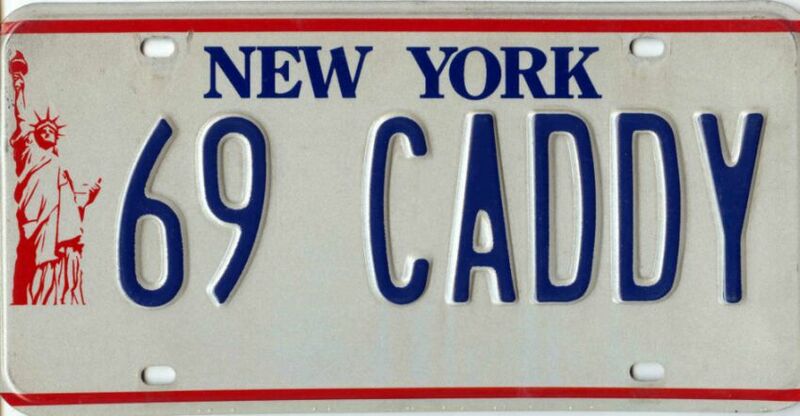 Many years ago, the NYS plate was "69 CADDY". 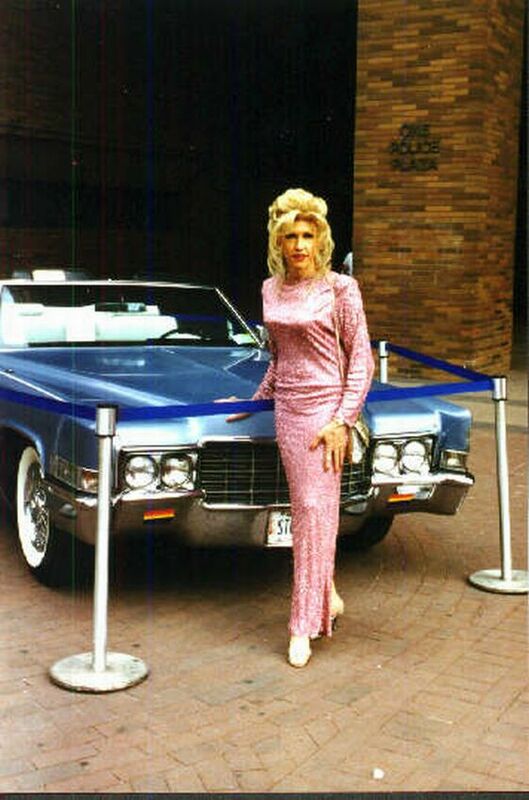 This is a very interesting story about the 1969 Cadillac "Stonewall Car"
in the Cadillac Car Club national newsletter by author VinceTaliano. Some excerpts are posted below. This is the direct link to the story! "On Friday night, June 27, 1969.... a metallic blue 1969 Cadillac DeVille convertible had been parked with its top down on the same block as The Stonewall Inn on Christopher Streeet.... It was spared any damage in the chaos that followed only because the car was driven (not towed) by two plainclothes NYCPD police officers who drove the eye-candy car to the old Sixth Precinct police station in Greenwich Village...."
On this S.V.A. website, the 1969 Cadillac "Stonewall Car" is always one of the "Top 5" weblinx out of over 100 files! Just to see this car, there were over 57,000 visits in the month of May 2006. 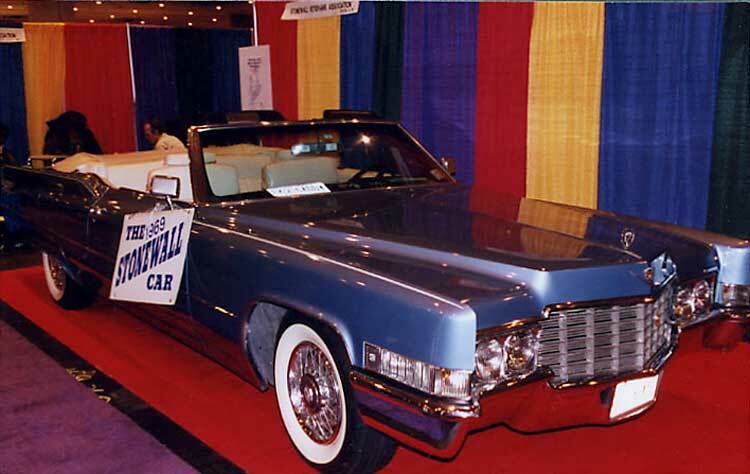 There were over 50,000 visits in April of 2007 for the classic 1969 Cadillac DeVille convertible "Stonewall Car" ! In September of 2007, there were over 56,000 verified visits. 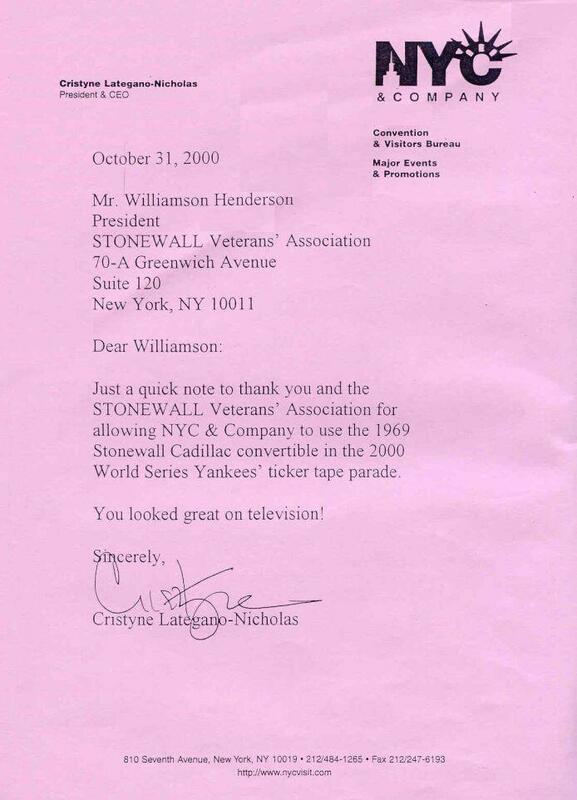 There were a whopping over 70,000 visits in just one month for the historic "Stonewall Car" in April 2008! For September 2008 and February 2009, there are over 50,000 visits each month! In July 2009, there were over 61,000 visits just to see a certain vintage Cadillac! Hot August 2009 hit over 70,000! With the new decade, the "Stonewall Car" is getting way over 50,000 verified visits per month! In August of 2010, the "SW-Car" file had a huge over 72,000 visits! 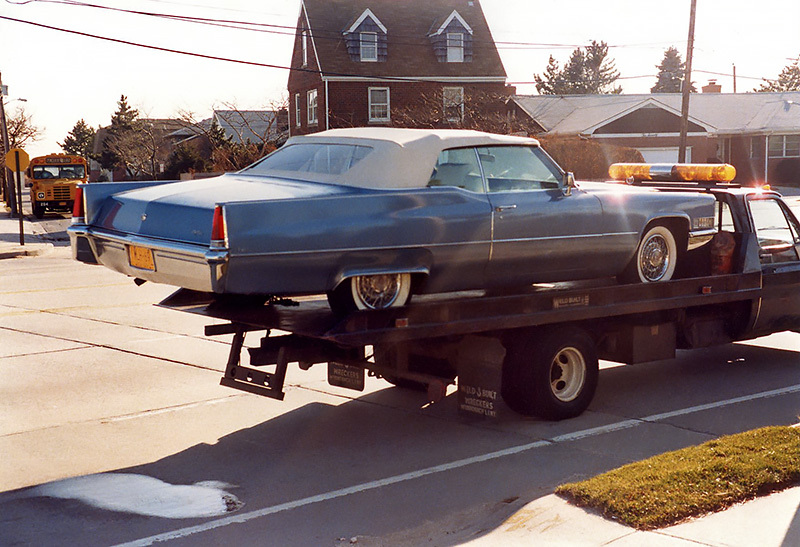 The 1969 Cadillac convertible file at the S.V.A. website kicked off 2011 with over 64,000 visits in January, over 60,000 big ones in April and over 62,000 in May 2011! For December of 2011, there were again over 60,000 visits! In fact, verified 'visits' to the 1969 Cadillac "Stonewall Car" webfile are cumulatively stronger than ever! The S.V.A. a;ways adds new pix throughout the year! See 1969 "SW-Car" statistics for month of April 2016. Out of over 100 webfiles at the S.V.A., the "SW-Car" in January was #2!! At the statistics file, scroll to"Referrer Report". U-turn can't miss it! Internet Photos of the 1969 Cadillac featuring the "Stonewall Car"
Support the Historic "Stonewall Car"! 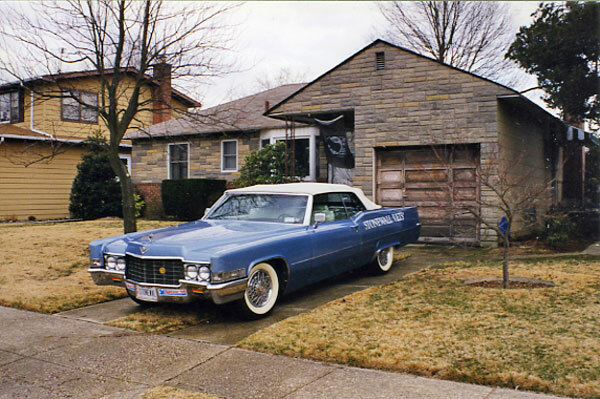 including planned restorations, both pro-active and decorative, of the blue 1969 Cadillac convertible "Stonewall Car"! Note: The brown arm in the red shirt belongs to the SVA's AnDre Christie. You may contact the S.V.A. with comments, suggestions and/or questions. "Stonewall Car" theme color for April is green for Easter! 50th year of the 1969 Cadillac ...and the 1969 "Stonewall Car"! !